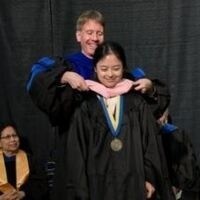 The College will recognize the special accomplishments of all graduating master's and doctoral candidates through a graduate hooding ceremony. Following a centuries-old tradition, master's and doctoral candidates will be formally hooded by their respective faculty. A reception will follow the program. All family and friends of graduate students are cordially invited to attend the ceremony and reception. Individuals who would like to request accessibility accommodations should contact sstjohn@ithaca.edu. We ask that requests be made as soon as possible to ensure they can be met.